2 Bedroom deluxe condo at Atlantis Resort - Why stay in hotel room? Atlantis passes (wristbands) included (complimentary) with this rental for upto 6 guests. 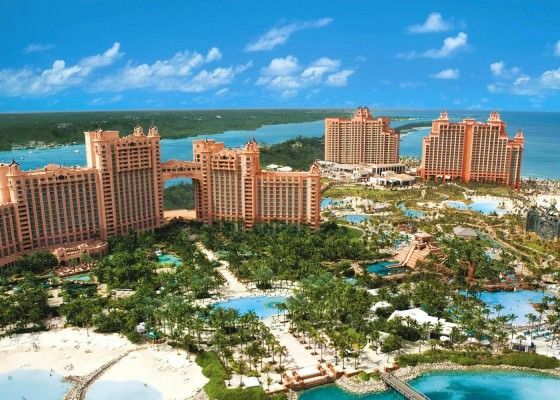 I own timeshare at the Harborside at Atlantis, which is part of the Atlantis resort. Guests of Harborside get bracelets (for free) to enjoy all activities and amenities of Atlantis resort. This listing is for a 2 bed, 2 bath (Deluxe) condo which is not a lock-off. Sleeps 6 max and it has a balcony and full kitchen. The number of bracelets given is same as the sleeping capacity listed. 24 hours front desk reception. Internet available for extra charge. Everything as promised. Wrist bands worked perfectly to water parks and condo was very clean and nicely furnished. Mostly cooked in but taxied into fish fry area for two dinners. Delicious!! Would repeat this vacation with our son and granddaughter in a heartbeat. Mid 80's and sunny every day. What's not to love? Dr. Vic was super easy to deal with and communicated well. Property was great and loved our stay. Will return! Appreciate you taking the time to write this stellar review. I own such condos all over the world and I have over 100 listings on VRBO. I look forward to arranging your family vacations in future years in some of my other popular destinations. Great stay, great staff, beautiful property. Only complaint is having to pay an excessive amount for wifi. This should be included. The property is amazing. We had a two bedroom lock-off (larger 1BR and connected smaller 1BR). We had a fully equipped kitchen, widescreen TVs on the living rooms and bedrooms. The foldout bed (queen) is very comfortable. The biggest factor is the convenience. Free shuttles (2 minutes) to The Royal, Cove, Beach etc and they run till late. No need for a cab. They offer a great service shuttle service to the supermarket at 10am, plus the bus actually waits for you. The property is clean and up to date. As a note: bring a chromecast or similar device. Frankly, I am happy I chose the condo route. Full access to all of Atlantis' activities plus you have the benefit of having your own apartment at the end of the day. We had a great stay at Harborside, we rented a 3 bedroom lockout (1 unit with 2 bedrooms/2 bathrooms full kitchen and 2nd unit was 1 bedroom with 1 bathroom and a kitchenette) there was a door that connected both units. We were in building 5, which was close to the pool and restaurant. We walked to the grocery store over the bridge (SuperValue) and walked back but you can ask the manager to call you a cab to take back if you have a ton of stuff. I brought a case of food with me. There is a liquor store in that same complex too. We really liked the Harborside it was very quiet and a nice break from the craziness of the Atlantis property. The Marina is a short walk away and we ended up walking around there quite a bit as well. Highly recommend working with Dr. Vic! My family (wife and three kids) and I stayed at Dr Vic's condo at Harborside and I highly recommend the condo and Atlantis. The condo was very large with plenty of room for five people. The condo was nicely decorated and in very good condition. Everything that we needed for an extended stay was available; kitchen, washing machine, powerful air conditioner, satellite TV etc. It was also nice to have smaller items, such as dishwashing liquid, laundry detergent, extra towels and linens, available in the condo. I'm usually leery to rent rooms with sofa sleeper sofas, but my son slept on the sleeper sofa during our stay without complaint. This was our first trip to Atlantis and I was impressed with how well everything was organized at the resort. Check in was fast. The shuttle bus that run between resorts ran frequently. Oceanside offers a morning shuttle to the grocery store that was quick and efficient. All of the staff that we encountered at Atlantis and Oceanside were exceedingly polite and very helpful. The only negative I could come up with for our trip was that restaurants are on the pricey side and they may have long waits without reservations. Cooking a few meals at night and eating breakfast at the condo definitely saved some money. Dr Vic was very helpful with my numerous questions. I would definitely recommend Harborside for families or larger groups.